I've always made sure my daughters helped out around the house. Some of it is admittedly self-serving, being a busy single mother, but mostly I think it's important to foster a sense of responsibility, work ethic, and independence, and to develop the skills to take care of themselves and their home. 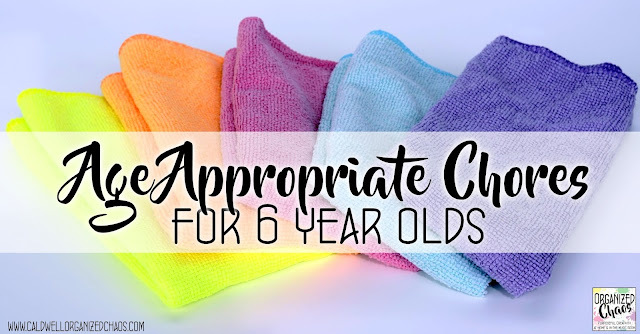 Now that the girls are 6 years old they've added a few new things to the list of chores they can do, so today I'm sharing the kinds of tasks my daughters do as 6 year olds! 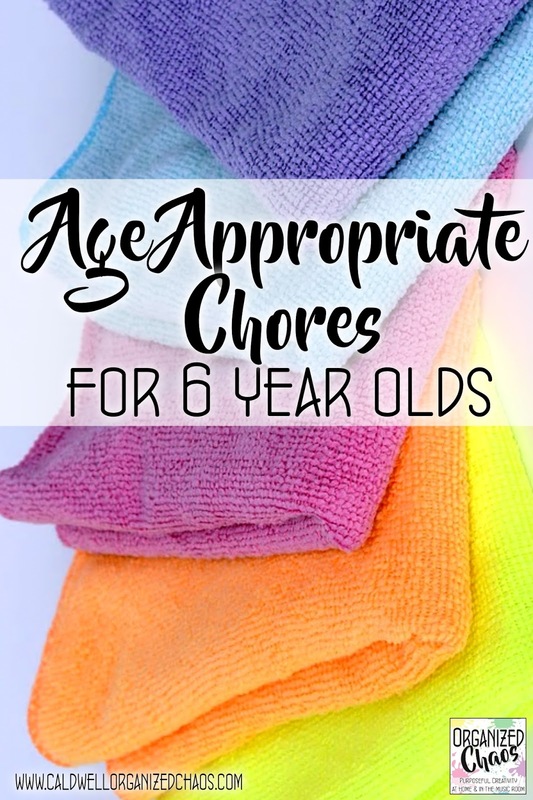 Of course every child is different, but hopefully this will be a good starting point for any parents trying to figure out how to get their young children helping out around the house. Before we get to the list itself, I should mention that I'm not including "self-care" types of things on this list- it's assumed that they brush their teeth, get dressed, and clean up after themselves when they get out toys to play with. 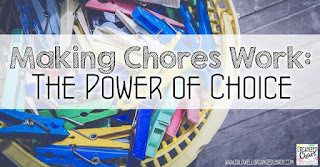 It's also worth noting that my girls have been doing "chores", at a much more basic level, since they were about 3 years old, so we've been building up to these tasks for several years (you can find my old posts detailing the chores they did at younger ages at the end of this post). With that said, here are the chores my 6-year-olds currently do. 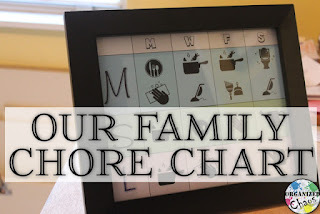 They usually each do 1 chore a day, so they aren't doing all of these all of the time, but they do help out with all of these at some point in any given week. Getting a stick vacuum has made it a lot easier for the girls to help out with vacuuming, and they love doing it! Sweeping is something they've been doing for a while, especially cleaning up under the dining room table. The girls are reliable enough with the dishes now that they can handle regular (non-plastic) dishes and can get them in and out of the dishwasher without dropping them! The girls plan and cook dinner once a week, and they are more and more independent in the kitchen as their confidence grows with things like knives and ovens. You can read more about how I got my preschoolers started cooking meals in this post. This is another new addition- our washer and dryer are downstairs and our bedrooms are upstairs, but they are strong enough now to carry a load of laundry up the stairs to put it away. The girls have been putting their clean clothes away in the closet for a while now, thanks to an easy-to-use closet setup. See their closet in this post. The girls don't do this on their own yet, but often when I am taking out the trash they will help carry a small container of recycling or trash so I don't have to make as many trips outside. Checking the mail is still one of the most exciting things they do, but now with the added anticipation of getting their own mail- their grandparents gave them subscription boxes for Christmas so they have loved getting packages addressed just to them once a month! I don't keep a lot of house plants, but they especially like to help water the small garden we have in front of our house, especially in the summer. The last couple of things are more just routine things the girls do, but I thought they were worth including- they have really gotten into making their beds lately, smoothing out their covers and arranging their stuffed animals! Every day when we get home from school the first thing they do is empty their backpacks. 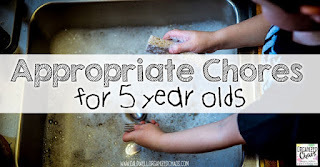 Helps me get everything cleaned up before we get into homework and dinner time! 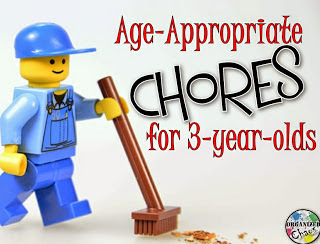 As we get closer to summer vacation and then the start of 1st grade, we'll probably be revisiting their chores again. It is ever-evolving as the girls continue to grow! Want to get timely ideas and resources set to your inbox? Click here to sign up for the Organized Chaos newsletter!